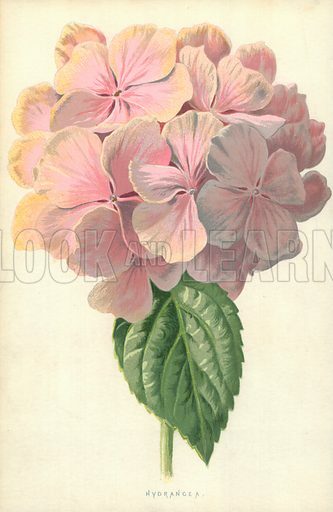 This edited article about the hydrangea originally appeared in Look and Learn issue number 170 published on 17 April 1965. If you ever see a gardener potting a hydrangea plant like this one and mixing iron filings with the soil do not imagine that he is a victim of absent-mindedness! The gardener will be well aware of what he is doing – because iron filings mixed with the potting soil of a red or pink hydrangea turns the flowers blue. It is a trick practised by gardeners on this attractive flowering shrub when they want to change their colour scheme. After the iron filings are added the gardener waters the soil with alum at the rate of one teaspoonful dissolved in a gallon of rain water. Actually, the iron filings method of turning pink hydrangeas blue has been superseded today by “blueing powders” which do the same job more efficiently when added to the soil. Many different varieties of these small-petal plants were cultivated in China and Japan centuries before their introduction to Western gardens. European gardeners are particularly fond of the plant for their terrace tubs, and they make a splash of colour in a tub on the patio or veranda of a town flat. Hydrangeas are grown by taking cuttings, inserted in potting soil between May and August. The pots should be kept in a propagating frame in a greenhouse or in a closed cold frame. On sunny days the cuttings should be shaded from bright sunlight. When the cuttings are rooted they need some air, and soon the young plants will be ready for separate potting in compost. By autumn or early spring the plants will have grown to the point where they will again need re-potting. Nearly all hydrangeas lose their leaves in winter and they need a certain amount of protection from severe weather. It is a good idea not to let them suffer a temperature below 45 degrees Fahrenheit. In early springtime hydrangeas grow fast and this is the time when they enjoy a regular meal of weak liquid manure. With the proper treatment you can get a magnificent head of bloom in the plant’s first spring from cuttings rooted the previous May. In summer the flower heads fade and as soon as this happens is the best time to prune the plants. In late summer and autumn the flower buds form at the ends of the shoots ready for the following spring, which is why it is important not to prune the plants after the summer is over. Many of them are quite hardy, and make large bushes outdoors. This edited article about poisonous creatures originally appeared in Look and Learn issue number 1018 published on 12 September 1981. Green, amber, red . . . we are all familiar with traffic lights, and understand that green is safe, amber a warning, and red emphatically means “Stop!” Traffic lights are a relatively recent invention, but warning colours are far from new, and have evolved over millions of years. In nature, vivid colours – particularly red – often warn of danger, and it can be as wise to stop well away from an animal or insect with bright warning colours as it is to obey the red traffic light. In Britain there are few dangerous or poisonous creatures, but if you think carefully you might well recall some examples. The wasp’s bright yellow and black stripes warn of its nasty sting, just as the zig-zag pattern on the back of an adder hints at its venom. In contrast, the harmless grass snake is green. However, have you ever wondered why ladybirds are red and black, or why certain moths, such as the garden tiger and red underwing, have bright red underwings? The answer, of course, is simple. 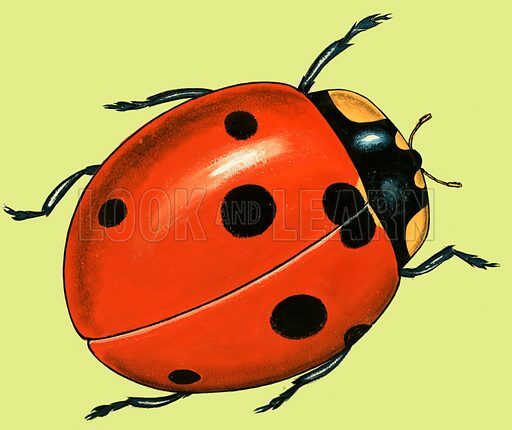 Ladybirds are poisonous, and their colouring warns birds to leave them well alone. Starlings feed their young on insects, but in a study in Holland it was found that out of 16,484 insects taken to feed nestling starlings by their parents, only two were ladybirds, so their coloration really does protect them. An interesting aspect of the ladybird’s defence is its ability to ooze blood from its leg joints when attacked. This is called reflex bleeding. Ladybirds are not the only British beetles to display warning colours, for the cardinal beetle does so too. This crimson-red beetle receives its name from the similarity of its colouring to a cardinal’s robe; like the ladybird, it is also distasteful to birds. Most moths, when at rest, have cryptic colouring which helps them merge with their background. However, certain species, when disturbed, suddenly reveal bright red underwings, which has the effect of alarming a predator. 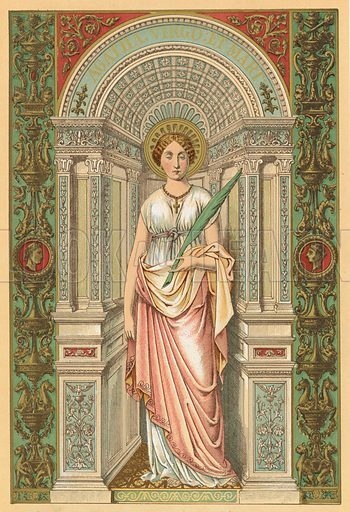 Saint Agatha is the Patron Saint of Catania, and is one of the most revered Saints in Italy and especially Sicily, where she lived and where she died a martyr in 251. A predatory Roman prefect of base origins and baser intentions had designs on her which she spurned, for which rejection she was tortured and humiliated, ultimately being placed in a brothel run by a madam called Aphrodisia. This immoral woman advised Agatha to save herself by worshipping the Roman idols and submitting to the will of Quintianus, but she refused with simple rhetorical grandeur and profound moral sureness, proclaiming her faith in the love and power of Jesus Christ. She was subjected to appalling torture and humiliation, but clung to her faith throughout with luminous and exemplary courage. Saint Peter appeared at her martyrdom and cured her mutilated body, which now rests at the Badia di Sant Agata, Catania. Many more pictures relating to Saints can be found at the Look and Learn picture library. Henry Courtney Selous was a British painter, illustrator and lithographer. Born in Deptford, London, in 9 May 1803, Selous was the third son of Gideon Slous (1777-1839) who, as George Slous, was a Flemish portrait and miniature painter. Henry’s brothers included Frederick Lokes Slous, who became Chairman of the London Stock Exchange; and Angiolo Robson Slous, the playwright who penned True to the Core: A Story of the Armada. Henry was educated at the Royal Academy Schools and exhibited his first work at the Academy. His first four contributions were studies of animals before he switched to human portraiture. Most of his early works were signed Slous, but he adopted the name Selous in the 1830s. In the 1840s he began painting historical subjects, winning £200 for his submission to the New Palace of Westminster cartoon competition for the design of frescoes for the new building in 1843. His paintings also recorded contemporary events, such as The Opening of The Great Exhibition (1851) and The Glorious Charge of the Heavy Brigade (1855), which depicted the Battle of Balaclava. He also produced illustrations for Shakespeare and John Bunyan’s The Pilgrim’s Progress. Selous was married to Emily Elizabeth Bone in 1837 and had four daughters: Jane, Maria Louisa, Emily Elizabeth and Annie Maria. Selous, who lived at 28 Gloucester Road, London, died at Winsford Tower, Beaworthy, North Devon, the house of his son-in-law, George Webb Medley (husband of Maria Louisa Selous), on 24 September 1890, aged 88. Many more pictures by Henry Courtney Selous can be found at the Look and Learn picture library. This edited article about the London Underground Railway originally appeared in Look and Learn issue number 944 published on 23 February 1980. The vicar, Dr. Cummings, was not alone in his distaste for the form of transport that was being advocated. Many churchmen feared God would wreak his vengeance on the human moles involved in this work of the Devil. Property-owners thought their buildings would fall as a result of all the excavations taking place. In fact, some of these fears may not have been groundless, for many buildings had to be shored up with timber while the work was in progress. Anyone visiting London during 1861 could well see the reason for people’s concern. 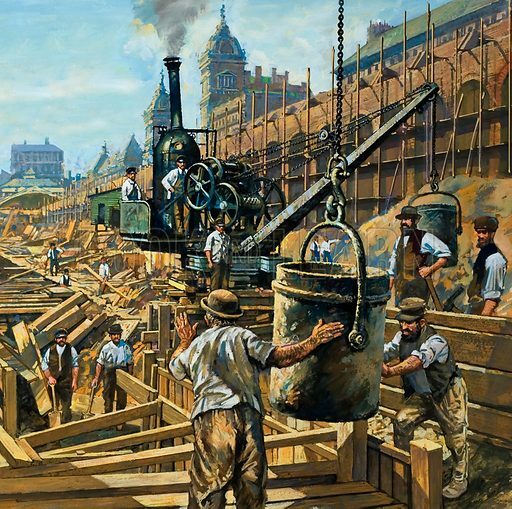 In the vicinity of King’s Cross, gangs of workmen were furiously digging up the streets. Great yawning holes marked where the road had once been, leaving only a small area over which carriages and pedestrians had to make their way as best they could. Some parts of the road were closed completely to allow the men to dig their holes. Once the holes were completed, with the mud piles high on either side, much to the annoyance of pedestrians, the men started shoring the sides of the hole. Then the upper part of the holes was enclosed in a brick arch. Once this was completed, the earth was replaced over the work, the surplus earth carted away, and the road relaid so that everything looked as it had before. But there was one main difference. Eighteen metres below the new road surface lay a long tunnel that stretched between Paddington and Farringdon Street, a distance of about six kilometres. The person chiefly responsible for this undertaking was Charles Pearson, a city solicitor. Since 1843, he had been suggesting that London should have an underground railway system. He suggested that a trial section should be constructed along the valley of the River Fleet, which had been arched over and converted into a sewer. It would use trains powered by atmospheric pressure. 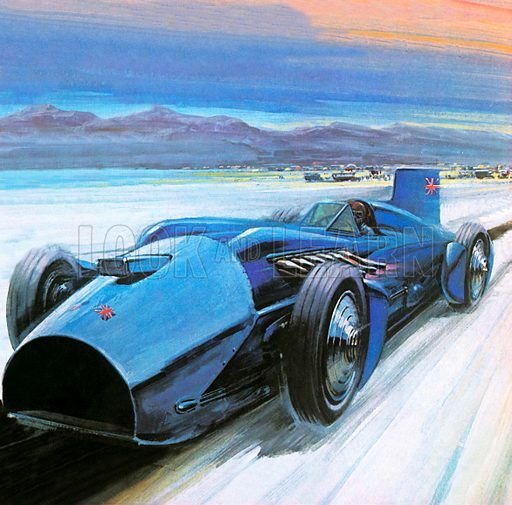 In spite of Pearson’s pleas the plan was never followed up, but he continued to campaign for this new form of transport. The idea was not, however, entirely new; for what can possibly be regarded as the first underground railway was started in 1770 at East Kenton Colliery near Newcastle-upon-Tyne. The railway, used to carry coal trucks on simple wooden tracks, consisted of a single tunnel, which can lay claim to being the first railway tunnel. Eventually people began to listen to Pearson’s ideas and in 1851, the year of the Great Exhibition in London, when British pride in its engineering feats was at its height, a committee was set up to examine Pearson’s suggestion. This edited article about Sir Walter Raleigh first appeared in Look and Learn issue number 551 published on 5 August 1972. He was a gallant, witty, brave and light-hearted adventurer, a typical example of those members of the Devon gentry who had been engaged in maritime adventure, often of a piratical nature, ever since the reign of Henry VIII. He was tall and handsome and his name was surrounded by legends. He had thrown his mantle on the ground to help Elizabeth I to walk dry-shod over a puddle, they said, and he had scribbled verses with a diamond on a window pane to attract her attention. 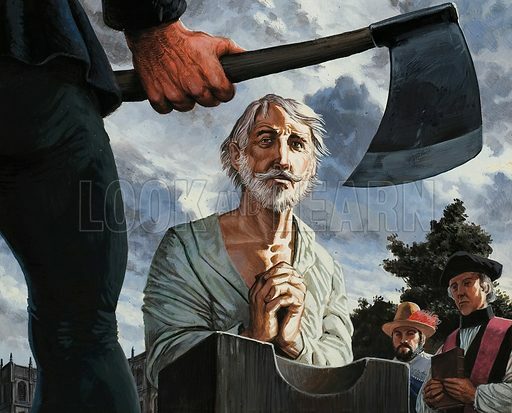 There was the tale that once, while he was lying in prison under sentence of death, he had asked for one night of freedom to rescue a lady, promising to return afterwards, and actually doing so when his wish had been granted. Whether or not these stories were true, there was one thing that could not be denied. The name of Sir Walter Raleigh was one that was known throughout the whole of the land. Although the pampered favourite of Elizabeth, he had done much for England. He had been tireless in his efforts to create a colony in America, he had helped to prepare the English fleet which had eventually defeated the Spanish Armada, and he had fought with distinction in Ireland. He had taken part in various expeditions against the Spanish, notably at Cadiz where he had been wounded, and he had sailed at the head of an expedition to Guinea, vainly seeking the fabled El Dorado, which was supposed to be a treasure house of gold. But all that was in the past. Now he was considered to be nothing more than a discredited adventurer who was guilty of treason. Locked up in the Tower for this crime, he had languished there for almost thirteen years, which had given him plenty of time indeed to reflect on how he had contributed to his own downfall. 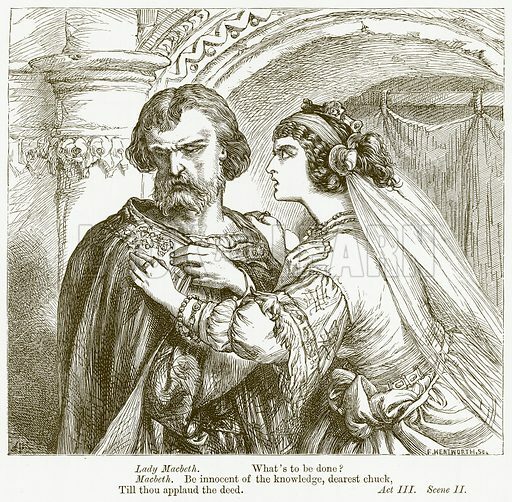 His star had begun to wane in the reign of Elizabeth, when he had married one of her maids of honour, a presumption for which he had been punished by being put in the Tower for a while before being banished to the country. His fall from grace had been greeted with delight by the whole population, for his greed, arrogance and the fact that he was a suspected atheist, had made him the most unpopular man in England. When he had been allowed to return to court, he had immediately quarrelled with the Queen’s new favourite, the Earl of Essex. The fact that he had helped to put down the revolt that Essex had eventually led against the Queen made no difference to the feeling of the people. Essex had been their favourite, and his death under the headsman’s axe, thanks partially to Raleigh, was merely another black mark against him. This edited article about the Princes in the Tower originally appeared in Look and Learn issue number 997 published on 18 April 1981. 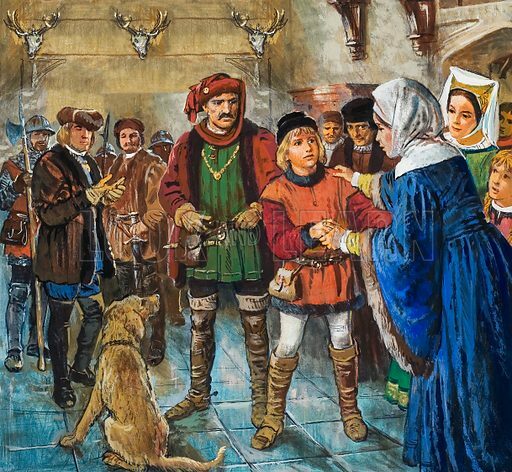 Few kings of England have been born in such impoverished and perilous circumstances as Edward V. His birthplace was a gloomy building called the Sanctuary, at Westminster, where his mother had sought refuge after her husband, Edward IV, had been forced to flee temporarily to Holland. A midwife named Mother Cobb was called into the Sanctuary to attend to the birth and a doctor named Serigo helped her. The danger of the whole Sanctuary party being starved into surrender by their enemies the Lancastrians was averted only by a well-disposed London butcher named John Gould, who supplied them with “half a beef and two muttons every week”. A few months later a victorious King Edward IV was back in London. Warwick the Kingmaker was dead and the fortunes of the House of York were restored. So the baby prince, born within a building that had hitherto provided shelter for murderers, robbers and other fugitives from justice, was now heir to the throne of England. Two years later little Prince Edward had a brother. The new baby was called Richard and soon afterwards created Duke of York. When Richard was still only four he was married with proper ceremony to three-year-old Anne Mowbray, daughter of the Duke of Norfolk. Richard’s brother Edward, then six, went to the wedding and afterwards all the guests sat down to a fine wedding feast. Very little else is known about the short lives of Edward and Richard. The Prince of Wales, says one report, was forever talking about all the wars he would fight and win when he became king, but for a small boy in the 15th century that was normal behaviour. 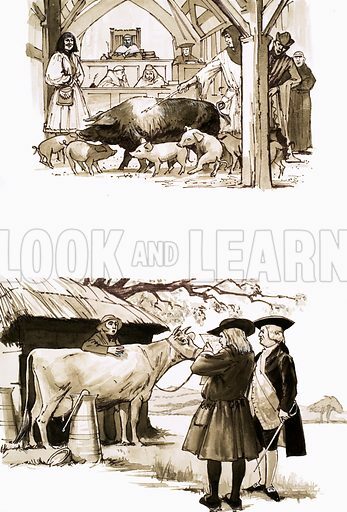 This edited article about legal systems first appeared in Look and Learn issue number 527 published on 19 February 1972. Imagine your surprise if you saw a pig, a cow or even a wild animal such as a fox or a badger, being led into court to be tried by a judge and jury! If you had lived on the Continent in medieval times, such a spectacle would not have surprised you in the least, for in those days it was quite common for both domestic and wild animals to be brought to court, there to be tried, sentenced or acquitted, according to the jury’s verdict. These animal courts were not staged for fun. They were conducted in all seriousness, with eminent lawyers acting for plaintiff and accused, exactly as they do when people are tried in our courts today. Not long ago a bird was blamed for causing a thatched cottage to be burnt to the ground. It was suggested that the bird had taken a still smouldering cigarette end into the thatch for use as nest-building material. If the same thing had happened in medieval times it would have been the solemn duty of the ecclesiastical court to publicly declare the bird to be under notice to quit the district forthwith. Fantastic, admittedly – but none the less true. The position was that civil courts had jurisdiction over all domestic creatures, including farm animals, whilst the church, or ecclesiastical courts, could call to trial and pronounce sentence on all forms of wild life, from wolves and rats down to insect pests such as ants and house flies. One of France’s most eminent jurists, M. Chassensee, made his name for his masterly defence of the rats in the Diocese of Autun, in the 15th century. The rats were accused of appearing in great numbers and annoying the townspeople and were therefore summoned to appear before the local ecclesiastical court. The defendants were described as “dirty animals of grey colour living in holes.” As the rats failed to appear in answer to the summons, the prosecution demanded sentence right away. But Chassensee argued that All the rats in the diocese were interested parties and they, too, should be called to give evidence. The curate of every parish was therefore commanded to issue a general summons. Still no rats turned up.